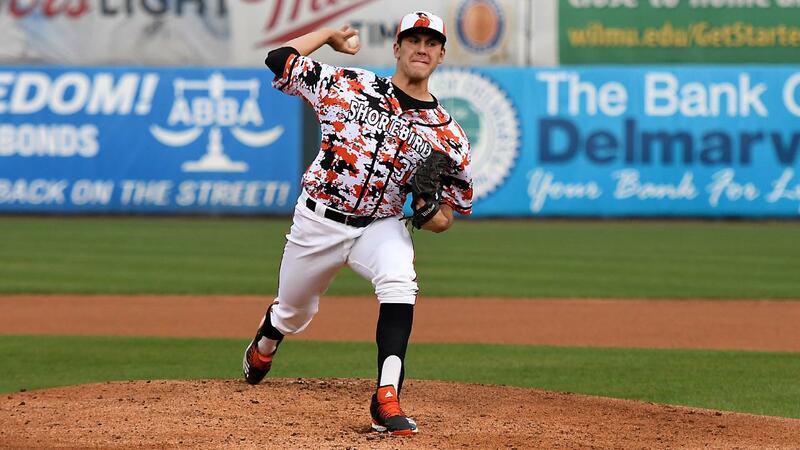 SALISBURY, MD - The Grayson Rodriguez Show arrived at Arthur W. Perdue Stadium on Friday night as the Delmarva Shorebirds' ace shut down the Lakewood BlueClaws, lifting his team to their fourth straight win, 5-3. Rodriguez (2-0), the No. 5 prospect in the Orioles system, struck out 10 batters for the second straight outing. He allowed just one hit and walked three over six scoreless innings for his first career Quality Start. Through two starts this season, Rodriguez has not allowed a run in 11 innings, giving up just three hits, walking five, and striking out 20. Victor Santos (1-1) took the loss for the BlueClaws (3-5), giving up three runs (two earned) on seven hits in five frames. Jhon Peluffo earned his second save of the year after handling the ninth. The Shorebirds (6-1) got to the 18-year-old Santos early in the first. Cadyn Grenier and Robert Neustrom led off with singles, and Adam Hall nicked a swinging bunt back to the mound for an infield hit to load the bases with nobody out. After a fielder's choice at the plate and a flyout, Daniel Fajardo came up with the breakthrough hit, muscling a grounder into center to score Neustrom and Hall to put Delmarva up 2-0 early. Santos settled down from there, but the BlueClaw defense let him down in the second. With two out Andrew Fregia hit a grounder to first that Matt Kroon booted. Grenier followed with a single to advance Fregia to third, and Neustrom threaded a grounder through the right side for an RBI infield hit, making it 3-0. Rodriguez ran into trouble just once, walking back-to-back men to start the third but retiring three in a row after. He retired the final eight men to face him, including inducing an inning-ending double play to end the fourth. Four of Rodriguez's six innings saw him throw just 9-to-11 pitches. Delmarva added on some insurance in the seventh. Grenier and Neustrom hit back-to-back leadoff singles, and Hall golfed a perfectly-placed soft liner down the right field line. Both runners scored on a double, and Hall took third on a throwing error from right, putting the Shorebirds on top 5-0. Lakewood made things interesting in the eighth inning. Jonathan Guzman walked with one out, took second on a grounder, stole third, and came home on a wild pitch to break up the shutout. With two outs and the bases empty, Alec Bohm and Ben Pelletier drew back-to-back free passes, and Malvin Matos singled to drive home another and make it 5-2. Delmarva's Jalen Miller then struck out Kroom to end the threat. With two out in the ninth, Carlos De La Cruz laced a double to left, and Guzman followed with an RBI single to get it to 5-3. Peluffo eventually settled down and threw out Luis Garcia on a bunt to end the game. The top three hitters in the Shorebird order combined to go 9-for-13 with four runs and three RBIs. Grenier finished 3-for-5 with a run scored; Neustrom went 3-for-4 with two runs and an RBI; and Hall put up a 3-for-4 spot with a double, run, and two driven in. Matos finished 2-for-4 with an RBI to lead the BlueClaws at the plate. Guzman reached three times, going 1-for-2 with a run, RBI, stolen base, and two walks. With Hickory's 6-4 loss at Kannapolis, the Shorebirds move into a tie for first place in the SAL Northern Division. The Shorebirds aim for five wins in a row on Saturday night against the BlueClaws. Drew Rom (0-0, 0.00) will start on the bump for Delmarva, with Gray Fenter to follow, against Lakewood tandem Kevin Gowdy (0-0, 6.00) and James McArthur. First pitch is set for 7:05 p.m. with gates opening at 4:00 for batting practice. Saturday features a Q105 Fireworks show presented by the Delaware State Education Association; it's also another Hit the Books Game presented by Dr. Crouse at The Brace Place. Pregame coverage on Fox Sports 960 AM and the MiLB First Pitch App beginning at 6:50 with Will DeBoer on the call.